NEW YORK, NEW YORK (February 15, 2019) — In addition to performing masterworks from past centuries at major halls and with leading ensembles worldwide, pianist Kirill Gerstein has a deep interest in the music of our time, including that of composer Thomas Adès, with whom he has formed a close artistic relationship and performs together twice next month at Carnegie Hall. On Wednesday, March 20 at 8:00 p.m., Mr. Gerstein gives the New York premiere of a new piano concerto composed for him by Mr. Adès on commission from the Boston Symphony Orchestra, which performs the work under the baton of the composer, who is the BSO’s Artistic Partner. The concerto is the second work on the program, which opens with Liszt’s Mephisto Waltz No. 1 (orchestral version) and closes with Tchaikovsky’s Symphony No. 4. One week prior, on Wednesday, March 13 at 7:30 p.m., Mr. Gerstein and Mr. Adès perform as duo partners in a two-piano recital at Zankel Hall. 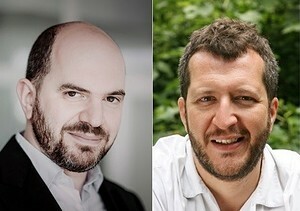 Having previously given duo recitals together at Tanglewood and in Paris, they reunite to perform the New York premiere of the two-piano version of Mr. Adès’s Concert Paraphrase on Powder Her Face, as well as Stravinsky’s Symphony of Psalms in the recently published and rarely performed transcription by Shostakovich, Debussy’s En blanc et noir and Lindaraja, and Lutosławski’s Variations on a Theme by Paganini. Both programs are also performed in Boston. Mr. Gerstein, Mr. Adès, and the BSO give the world-premiere performances of the new piano concerto at Boston’s Symphony Hall on March 7, 8, and 9, and Mr. Gerstein and Mr. Adès perform the duo-piano program at the New England Conservatory’s Jordan Hall on March 15. Tickets to the New York performances, priced $54–65 (March 13) and $15–161 (March 20), are available at the Carnegie Hall Box Office, 154 West 57th Street, or can be charged to major credit cards by calling CarnegieCharge at 212-247-7800 or by visiting the Carnegie Hall website, carnegiehall.org. On March 2, Mr. Gerstein also gives the U.S. premiere of Berceuse from The Exterminating Angel at the Northwestern Bienen School of Music in Evanston, IL. This is preceded in February by Mr. Gerstein’s world and UK premieres of the piece at Vienna’s Konzerthaus and London’s Wigmore Hall. In addition to Mr. Adès, composers who have written music for Mr. Gerstein include Timo Andres, Chick Corea, Alexander Goehr, Oliver Knussen, and Brad Mehldau, who were commissioned by the pianist using his 2010 Gilmore Artist Award. Pianist Kirill Gerstein’s curiosity and versatility has led to a powerful engagement with a wide range of repertoire and styles. From Bach to Adès, his playing is distinguished by its clarity of expression, discerning intelligence and virtuosity, and his energetic and imaginative musical personality has rapidly taken him to the top of his profession. An American citizen based in Berlin, Mr. Gerstein balances his career between the U.S. and Europe. Highlights of his 2018-2019 season in North America include re-engagements with the Cleveland and Philadelphia Orchestras, as well as with the Toronto, Atlanta, St. Louis, Detroit and Cincinnati Symphonies, and a tour with the Czech Philharmonic in California. His summer festival appearances include his debut at the Grand Teton Festival and a return to Chicago’s Grant Park Music Festival. Mr. Gerstein is also a frequent guest with the Boston Symphony Orchestra during the 2018-19 season. He is the Koussevitzky Resident at Tanglewood this summer and appears four different times throughout the festival, performing Rachmaninoff‘s Piano Concerto No. 2 with the BSO; Thomas Adès’s In Seven Days with the Tanglewood Music Center Orchestra, Mr. Adès conducting; a two-piano recital with Mr. Adès at Ozawa Hall; and Gershwin’s Rhapsody in Blue with the Boston Pops during the Tanglewood on Parade festivities. During the season, he premieres Mr. Adès’s piano concerto commissioned for him by the BSO, at both Symphony Hall in Boston and at Carnegie Hall in New York, and plays two-piano recitals with Mr. Adès in Boston and in Zankel Hall at Carnegie. Highlights of his European engagements this season include performances with the Leipzig Gewandhaus Orchestra, Rotterdam Philharmonic, London Symphony, Dresden Staatskappelle, Vienna Symphony, NDR Hamburg Orchestra, and the Orchestre Philharmonique de Radio France in Paris. Mr. Gerstein also records the second and third Tchaikovsky Piano Concertos with the Czech Philharmonic conducted by Semyon Bychkov for Decca. Kirill Gerstein’s recent North American engagements includes performances with the New York and Los Angeles Philharmonics, the Minnesota Orchestra, and the Chicago, San Francisco, Pittsburgh, National, Dallas, Vancouver and Houston symphonies, as well as recital appearances in New York, Chicago, Washington DC, Seattle, Miami, and at Princeton and Duke Universities. In Europe, Mr. Gerstein has played with such prominent orchestras as the Berlin and Vienna Philharmonics, Royal Concertgebouw Orchestra, Bavarian Radio Orchestra, the Munich, London and Oslo Philharmonics and the Finnish Radio Orchestra. He has performed recitals in Vienna, Paris, Prague, Hamburg, London’s Wigmore Hall and Queen Elizabeth Hall, and at the Liszt Academy in Budapest. He has also appeared at the Salzburg Festival as well as at Verbier, the Lucerne and Edinburgh Festivals, the Proms in London, and the Jerusalem Chamber Music Festival. Mr. Gerstein’s latest recording, The Gershwin Moment, released on myrios in 2018, features live recordings of the composer’s Piano Concerto in F and Rhapsody in Blue with the Saint Louis Symphony Orchestra conducted by David Robertson, selections from Earl Wild’s Virtuoso Etudes after Gershwin, and collaborations with vibraphonist Gary Burton and vocalist Storm Large. Also on myrios are Liszt’s Transcendental Études; Tchaikovsky’s Piano Concerto No. 1 in the composer’s own final version from 1879; Imaginary Pictures, which pairs Mussorgsky’s Pictures at an Exhibition with Schumann’s Carnaval; and a solo album of works by Schumann, Liszt and Oliver Knussen. His next release on myrios is a live recording of Busoni’s Piano Concerto with the Boston Symphony Orchestra. Brought up in the former Soviet Union studying both classical and jazz piano, Mr. Gerstein moved to the U.S. where, at age 14, he was the youngest student to attend Boston’s Berklee College of Music. Shifting his focus to the classical repertoire, he studied with Solomon Mikowsky in New York, Dmitri Bashkirov in Madrid and Ferenc Rados in Budapest. Gerstein has received a series of prestigious accolades, including First Prize at the 10th Arthur Rubinstein Competition in 2001 and a Gilmore Young Artist Award in 2002. In 2010 he was awarded both an Avery Fisher Career Grant and the Gilmore Artist Award, which provided the funds for him to commission new works from Timo Andres, Chick Corea, Alexander Goehr, Oliver Knussen, and Brad Mehldau. Keenly aware of the importance of working with young musicians, Mr. Gerstein taught at the Stuttgart Hochschule Musik from 2007-17 and, beginning in the fall of 2018, will teach at the Kronberg Academy’s newly announced Sir András Schiff Performance Program for Young Artists. For more information, visit kirillgerstein.com. Thomas Adès was born in London in 1971. Renowned as both a composer and a performer, Thomas Adès works regularly with the world’s leading orchestras, opera companies and festivals. His compositions include three operas: the most recent of which The Exterminating Angel premiered at the 2016 Salzburg Festival and subsequently has been performed at the Metropolitan Opera, New York and the Royal Opera House, London; The Tempest (Royal Opera House and Metropolitan Opera); and Powder Her Face. His orchestral works include Asyla (CBSO, 1997), Tevot (Berlin Philharmonic and Carnegie Hall, 2007), Polaris (New World Symphony, Miami 2011), Violin Concerto Concentric Paths (Berliner Festspiele and the BBC Proms, 2005), In Seven Days (Piano concerto with moving image - LA Philharmonic and RFH London 2008), and Totentanz for mezzo-soprano, baritone, and orchestra (BBC Proms, 2013). His compositions also include numerous celebrated chamber and solo works. Mr. Adès was recently appointed Artistic Partner by the Boston Symphony Orchestra through 2019; he will conduct the orchestra in Boston and at Tanglewood, perform chamber music with the orchestra players, and lead the summer Festival of Contemporary Music. He coaches Piano and Chamber Music annually at the International Musicians Seminar, Prussia Cove. As a conductor, Mr. Adès appears regularly with, among others, the Los Angeles, New York and London Philharmonic orchestras, the Boston, London, BBC, City of Birmingham, Melbourne and Sydney Symphony orchestras, the Royal Concertgebouworkest and last season he made his debut with the Czech Philharmonic. In opera, in addition to The Exterminating Angel, he has conducted The Rake’s Progress at the Royal Opera House and the Zürich Opera, The Tempest at the Metropolitan Opera and Vienna State Opera, and Gerald Barry’s latest opera Alice’s Adventures Under Ground in Los Angeles (world premiere) and in London (European premiere). This season he will conduct the London and Los Angeles Philharmonic orchestras, the Finnish Radio and Boston Symphony orchestras, as well as the Orchestre de Paris, the Leipzig Gewandhausorchester and Britten Sinfonia. His recent piano engagements include solo recitals at Carnegie Hall (Stern Auditorium), New York and the Wigmore Hall in London, and concerto appearances with the New York Philharmonic. In recital, this season he will give a solo programme of Janáček in London, Paris, Lisbon and the Czech Republic, Schubert’s Winterreise at London’s Wigmore Hall with Ian Bostridge, and he will join Kirill Gerstein in duo recitals at Carnegie Hall and the Tanglewood Festival. His many awards include the Grawemeyer Award for Asyla (1999); Royal Philharmonic Society large-scale composition awards for Asyla, The Tempest and Tevot; and Ernst von Siemens Composers' prize for Arcadiana; British Composer Award for The Four Quarters. His CD recording of The Tempest from the Royal Opera House (EMI) won the Contemporary category of the 2010 Gramophone Awards; his DVD of the production from the Metropolitan Opera was awarded the Diapason d'Or de l'année (2013), Best Opera recording (2014 Grammy Awards) and Music DVD Recording of the Year (2014 ECHO Klassik Awards); and The Exterminating Angel won the World Premiere of the Year at the International Opera Awards (2017). In 2015 he was awarded the prestigious Léonie Sonning Music Prize. For more information, visit thomasades.com. Wednesday, March 13 at 7:30 p.m.
Tickets, priced $54 to $65, are available at the Carnegie Hall Box Office, 154 West 57th Street, or can be charged to major credit cards by calling CarnegieCharge at 212-247-7800 or by visiting the Carnegie Hall website, carnegiehall.org. Wednesday, March 20 at 8:00 p.m.
Tickets, priced $15 to $161, are available at the Carnegie Hall Box Office, 154 West 57th Street, or can be charged to major credit cards by calling CarnegieCharge at 212-247-7800 or by visiting the Carnegie Hall website, carnegiehall.org.